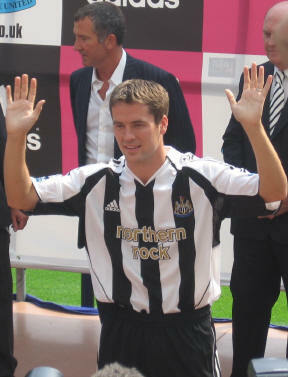 Is Michael Owen still quick enough to get out of Newcastle without being lynched? It is clear to see that some nasty injuries have claimed a yard or two of Michael Owen’s pace over the years, but he must still fancy his chances in a foot race if reports in this morning’s papers are anything to go by. Various newspapers reckon Manchester United, Liverpool and Chelsea have caught wind of a Â£9 million release clause in Owen’s Newcastle contract and will make a move. Owen has mustered 12 appearances for the Magpies in his two years at the club. I suspect the Toon Army would not be too happy to see their Â£17 million man depart so cheaply and having done little but sit in the physio’s room. BRILLIANT NEWS!Bring prince Michael back to anfield.